Have you ever had a plate full of sushi and feel ravenously hungry a few hours later? We love sushi, but are always looking for a way to make it more nutritious. Most rolls contain deep fried tempura and starchy white rice – not the best choices to make for blood sugar balance or disease prevention. 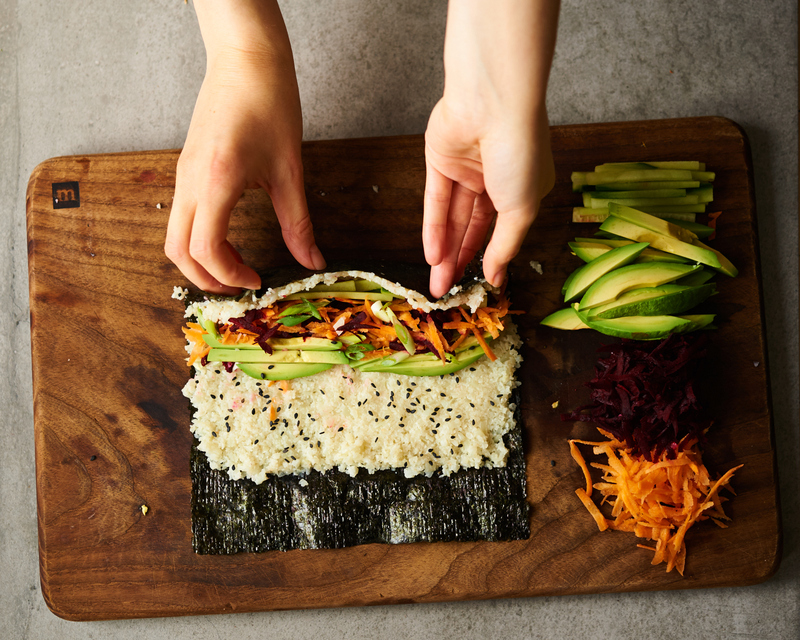 We were inspired to create these vibrant sushi rolls packed with cauliflower rice, raw veggies, and a drizzle of tangy tahini lime sauce. Cauliflower is a fibre-packed cruciferous vegetable that is a powerhouse for disease prevention. It’s not only delicious, but is rich in antioxidants like vitamin C, which can protect your cells from free radicals and inflammation. It also contains the phytochemical glucosinolate, which has been studied for its role in cancer prevention. A study completed by the Journal of the National Cancer Institute showed significantly lower lung cancer risk in women who consumed cruciferous vegetables (Feskanich, D., 2000). These are easy to customize with your favourite fillings and are a great option for those following a grain-free diet. Make this a full meal by serving with a heap of leafy greens dressed with our Carrot Miso Ginger Dressing. Add chopped cauliflower florets to a food processor (see tip). Pulse until it resembles a coarse meal. Melt 2 tsp of coconut oil in a pot over medium heat. Add riced cauliflower and sauté for 1 minute. Add water and cover pot with a lid, stirring occasionally for 5-6 minutes until completely cooked. This will allow the cauliflower to steam and become tender. Remove from the heat and set aside until cool enough to handle (about 20 minutes). Meanwhile, prepare remaining vegetables for sushi roll. Combine all ingredients for dipping sauce in a small bowl, adding water 1 tsp at a time to create a thinner texture if desired. Using a clean tea towel or a cheese cloth, drain out excess liquid from the cauliflower rice. Mix in rice wine vinegar, sesame oil, and salt into the cooled rice. Lay a bamboo sushi mat flat on your counter or cutting board. Place the nori with the shiny side down on top of the mat. Spoon about 1/3 cup of rice onto the nori, spreading out evenly and leaving the bottom third of the sheet (farthest from you) bare. Place rows of your veggies in the middle of the rice. Carefully roll the top of the nori over the veggies with firm pressure. Continue to roll away from you, dabbing the farthest edge of nori with water to seal it up. Using a sharp knife, slice each roll into 6-8 pieces. Serve with a sprinkle of black sesame seeds and a drizzle of tahini lime ginger sauce if desired. If you do not have a food processor, feel free to use a grater to grate the cauliflower into small pieces. You can also finely chop using a knife. Prepare as usual. You can roll on top of a clean tea towel, or just use your hands if you don’t have a sushi mat on hand. Feskanich, D., Ziegler, R. G., Michaud, D. S., Giovannucci, E. L., Speizer, F. E., Willett, W. C., & Colditz, G. A. (2000). Prospective Study of Fruit and Vegetable Consumption and Risk of Lung Cancer Among Men and Women. Journal of the National Cancer Institute, (22).